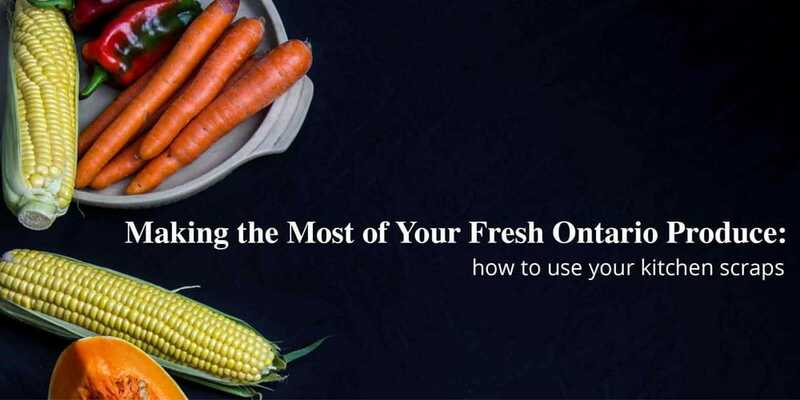 Are you trying to make the most of your local Ontario produce, to reduce your food waste, or to save a few dollars? There are many reasons to try and cut down on kitchen waste, but whatever your reason there are many ways to get the job done. From repurposing kitchen scraps into meals, regrowing vegetables or even using those scraps as compost materials – it’s not difficult to find a method that you can easily work into your lifestyle. It’s easy to throw out those little scraps of food that don’t seem to have much value like potato peels, parmesan rinds, and old berries. We even throw away vegetable pieces like broccoli stems, onion peels or cauliflower leaves that we don’t usually eat because most people don’t know all the different ways you can use them. Once you start reusing those little kitchen scraps, you’ll be amazed at how much you were throwing away before. Some of the easier ways to use up those kitchen scraps include: flavoured salts (use leftover lemon peels, or herb stems), stock (can use up almost any scraps), pasta sauce (can use scraps, or even the pulp from juicing), and bone broth (you can use frozen or fresh bones). There are many parts of vegetables that we usually discard that we can make use in some unexpected ways. Cauliflower leaves or the outer leaves of brussel sprouts can be crisp roasted and salted for a nutty healthy snack. Broccoli stems can be spiralized into noodles, potato peels make crispy thin fries, apple peels can be dried for snacks, and swiss chard stems can be pickled. If you want to put a little more effort in, you can make jams from too-soft berries, or bread from old zucchini, squash or bananas. You can even make some tasty limoncello using leftover lemon peels, or a fruit shrub to be sipped in the hot summer months. There are quite a few fruits and vegetables that you can use the ends of to replant and grow yourself, either indoors during the winter months or outside in your garden. This helps reduce your kitchen waste, continues the local food cycle, reduces your grocery cost and helps keep them on hand when you need them. Depending on your garden set-up you may only be able to regrow window herbs, but even this small step can be rewarding. Another unexpected food you can grow indoors are mushrooms, they love dark, cool and moist environments like your basement or under your sink. If you have a larger outdoor space you’re able to set your sights higher and get a little more ambitious. Vegetables with a base are usually the easiest to try and regrow such as lettuce, celery, and onions. Simply leave a good base on it and stick it into water, after some time you’ll notice tiny white roots starting to grow and you can carefully transfer it into a pot or the ground. Another way to continue the local food cycle at home is to collect seeds from vegetables like pumpkins, peppers, bean sprouts, apples, peaches, lemons or chestnuts. Germinating them is the first step, then plant them in your outdoor space! If you have kitchen scraps that you can’t repurpose, a great alternative to throwing them away is to create a home composter. Placing your composter in a sunny location with good drainage that is easily accessible year round. According to a report from the Commission for Environmental Cooperation, every Canadian on average throws away 170 kilograms of food a year. That makes Canada one of the biggest food wasters on the planet, higher than both United States and Mexico. Buying local at farmers markets, picking your own and repurposing food scraps are all ways to reduce food waste, while at the same time helping yourself and your family. We hope to see you back here at the farm soon to enjoy more delicious local Ontario produce.